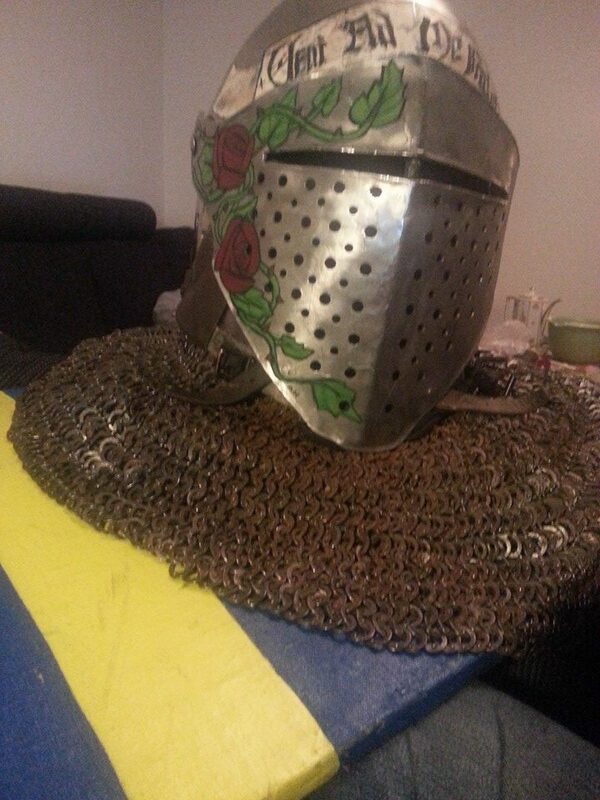 I also made a visor for it that was based off an image from the late 14th century. That is a very cool helmet! I know where to get one for a very good price too. 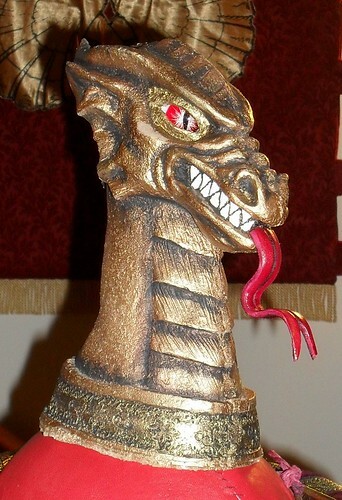 I bought a Dargen great helm from Andrey Galevskiy - I thought it had some nice lines. 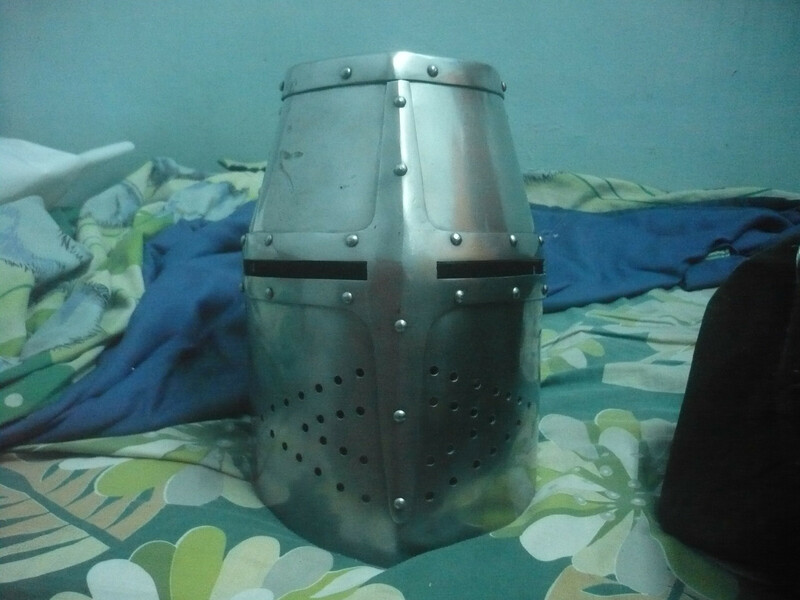 It wasn't until I compared it to the original Dargen great helm that I realized how good it looked.It's legal for "heavy" fighting, though I think I'll stick to my beater helm for that. 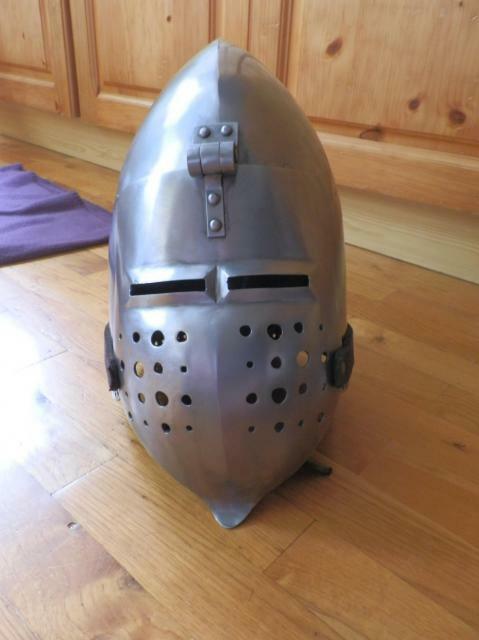 Bascinet with aventail from del tin. 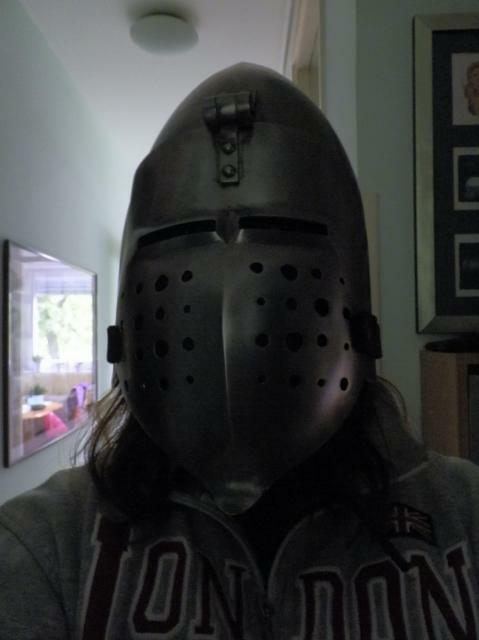 So far I've only got a spangenhelm made by Ulfberth from the times where we were legally allowed to import things overseas in my country. 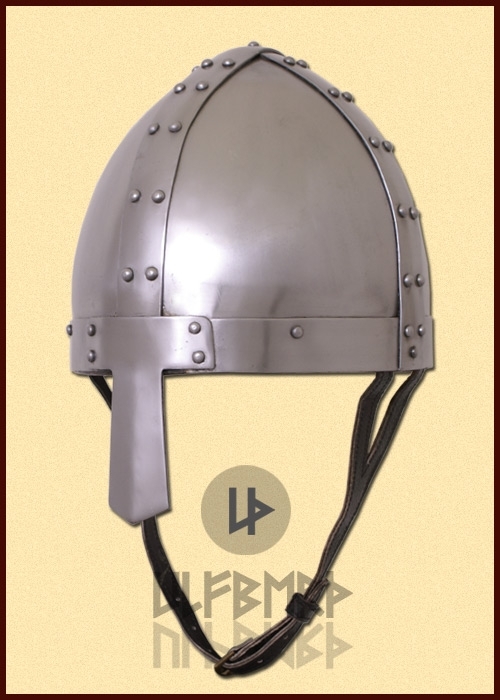 I want to have a kettle helm for my XIVth century set I'm makin', guess I'll have to make it myself too. 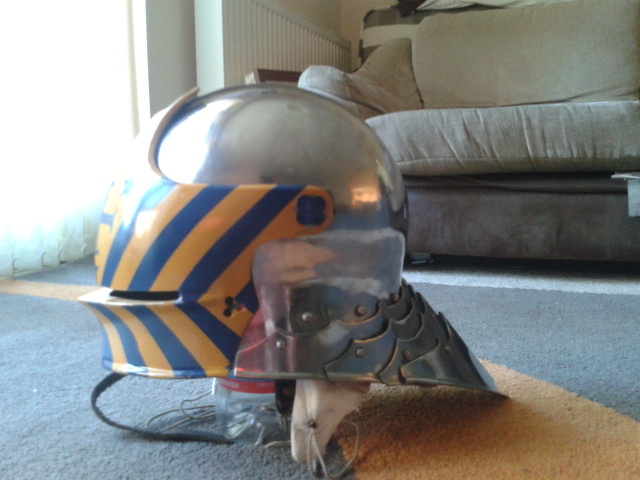 My sallet. Based on an original at Leeds. I love that treatment! Can you tell us more about how you did it? Tjarand's post prompted me to post my latest, roughly based on the sallet in the Walters Art Musuem. The lines are different from the original, and the occularium is wider than I'd prefer it to be, but I bought this secondhand as a project piece - I added the gilding to match the original and eagle-claw crest. While the claws might not be everyone's cup of tea, it's inspired by the dozens of images of such helmets in the Pastrana Tapestries. And, as the original had holes for a crest, I decided this needed one! I like it. The way the claw is opened and pointing forward give it an aggressive, "Coming to get you" sort of look, if that makes sense. Thanks - I like it too! And I like your sense of the intent and 'motion' imparted by the angle. Most of the images of claw-topped helmets that we have (and I'm guessing most of these are from the Pastrana Tapestries) show the claws as all 'seated' on, or touching the helmet, and I like having something inspired by this, but not of the exact same form. I was also curious about this choice of crest - were they slightly representative of being 'under' the domain of the double-headed eagle of the HRE? (But this doesn't account for the Pastrana helmets.) Or were they meant to somehow show some kind of affinity with the eagle itself, or an association of meanings of power, predation, and so on? Or were they just a motif of some kind, without a direct or literal connection to the content (think the ubiquity of Che t-shirts today, perhaps)? In any case, it also dawned on me that the eagle foot could be 'read' in almost the opposite way: the suggested eagle could be more 'active' - that the wearer would effectively be 'caught' by the claws. In this way, the 'raised' claw on my repro then actually becomes a 'descending' foot, about to land. So, whether open and 'I'm coming to get you', or descending and having a sense of motion and threat ... it gives a more engaging feel than just the 'prone' claw, I think. 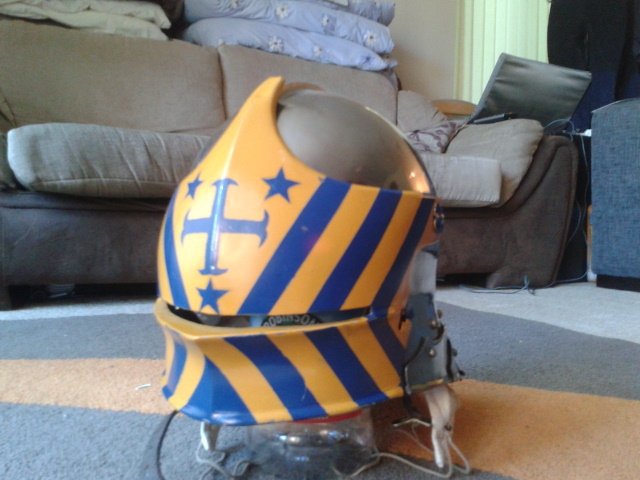 On another note, it was fun to make such a modification to a helmet. 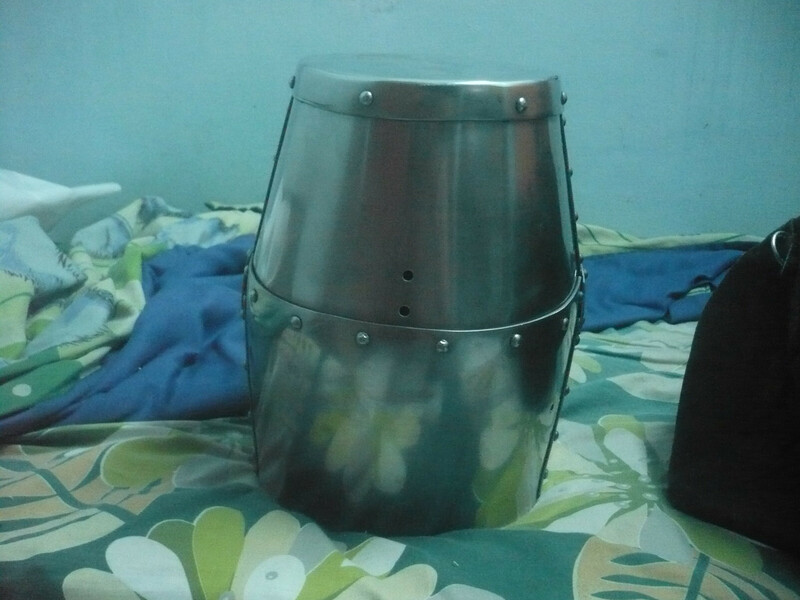 I already had another sallet with pre-drilled holes for a crest. To that one, I added a double-headed eagle, which I liked a lot. 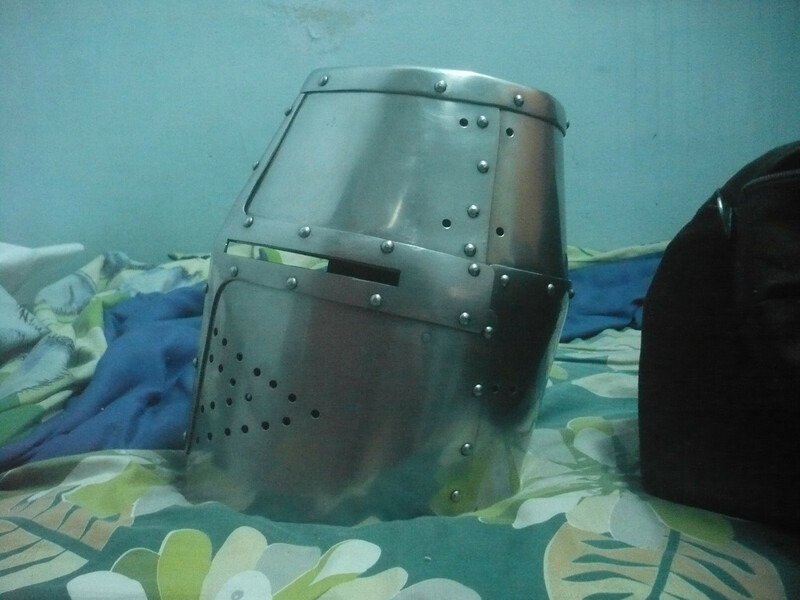 But actually making the decision to drill an intact helmet all for the sake of adding a crest that I wasn't sure would work or not was a completely different decision - there was almost a sense of not wanting to interfere with the armourer's original work, and leave it 'as it was intended to be'. 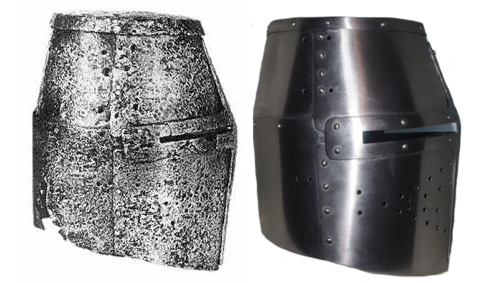 Finally finding some images that showed that the original Walters sallet had crest holes helped shift this. And, having now done it, I'm not less squeamish about modding other gear. Perhaps others who've added crests to helmets can include them in this thread too! 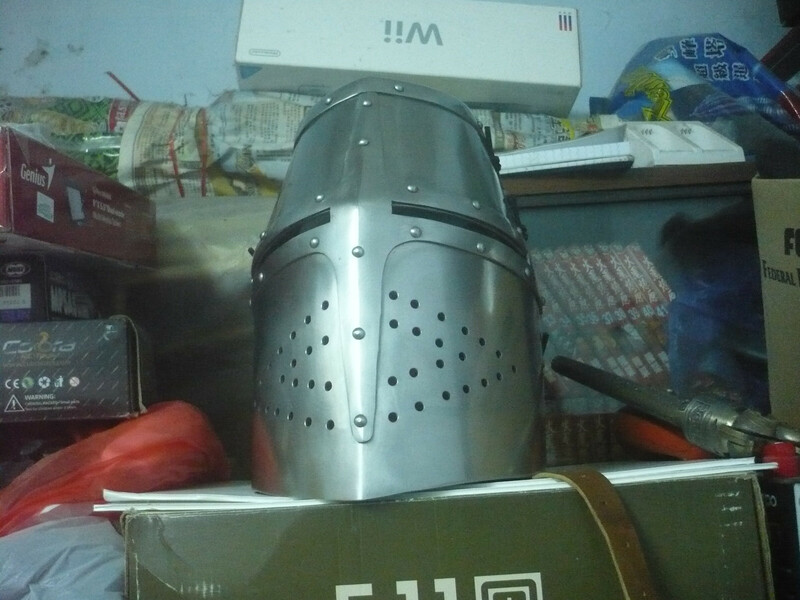 I had custom ordered a Dargen great helm from Mardinus, 2mm spring steel. Though I can notice some riveting mistake and not the most accurate, but it is definite worth the money. After installed the padding lining, polishing and oiling. Painted my kettle hat , but my hand writing is very bad. Sugarloaf 3mm stainless steel. With a not that historicly correct paintjob. 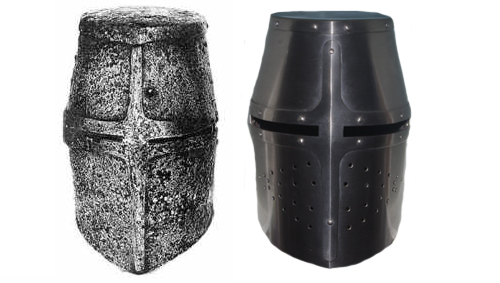 A line-up of some of my helms. 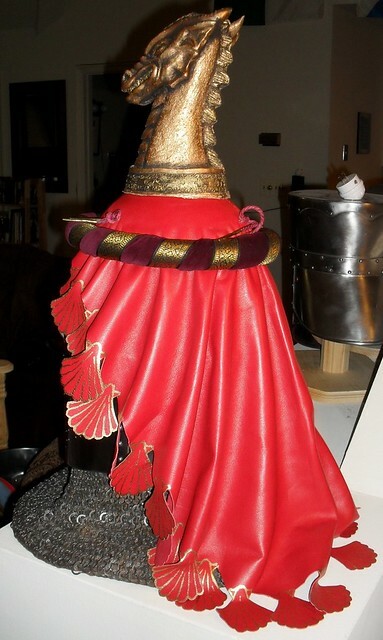 And my Pembridge greathelm over the bascinet w/torse mantle and crest on it. First off, nice partial collection. 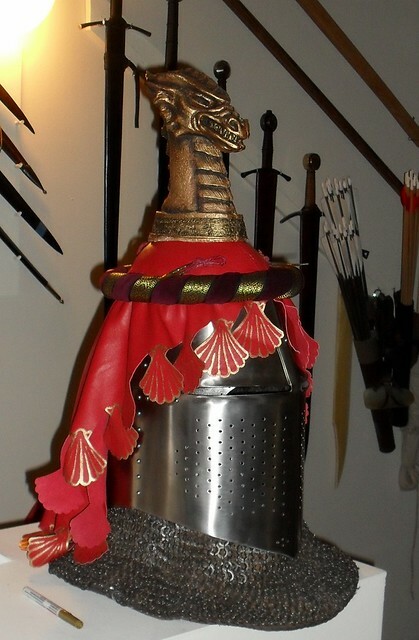 Secondly, your “Pembridge greathelm over bascinet w/torse mantle and crest” is very attractive! 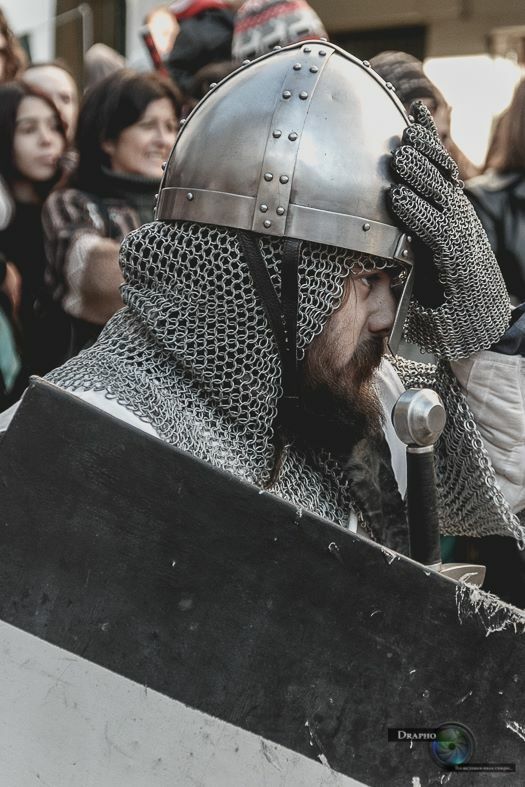 Hey, here are some pics of my helmet done by Jacek Matera. It was produced after the bascinet of chartres.